My mom went through a strange phase when I was about 8 years old. She was about 50 then, and she had this really odd behavior at times. But Rebecca and I knew exactly what to do. In the middle of pouring split peas into the pressure cooker or feeding wet laundry through the wringer, Mom would give a sudden desperate little shriek. Then she would sink into the nearest chair and gasp, "Fan mich! Fan mich!" Rebecca and I would immediately kick into action, whirling around and grabbing whatever our hands landed on--Rod and Staff Sunday school papers, the latest letter from Aunt Vina, the Spectors catalog, probably even a fly swatter--and then we'd stand there pumping vigorously with whatever object we had, fanning Mom as fast and as hard as we could until her breathing returned to normal and with a tired sigh she would tell us we could stop, and then she'd slowly get up and go back to work. We took this job seriously, as I recall, and didn't make fun of her like we did with so many other things she did. Or I should say "I" and not "we," generally speaking. Suddenly, in this as with so many other things, I have turned into my mom. In the middle of the night, the middle of church, the middle of supper, suddenly I turn into a human percolator as an unbelievably super-heated something comes boiling up inside, out to my shoulders and down my arms, up my neck and through my ears from bottom to top, forward to my face and back to my scalp. My eyes pop and my mouth flops open in an explosive "PAAAHHHH" and I fight an impulse to tear off my garments like the people of Nineveh in terror of judgment. My face turns bright red, sweat glistens, I grab the nearest Sunday school quarterly or newspaper and FAN FAN FAN. This evening I had a reading and signing at Barnes and Noble. Now this is a great honor for an author and an event at which one should conduct oneself with grace and dignity. I was standing there reading a chapter from Tea and Trouble Brewing to the assembled audience when suddenly THERE IT WAS, that maddening heat rising like some nuclear reactor gone wild. I wanted to yank off the chic little jacket Jenny had picked out for me and run outside into the rain. But no. I calmed myself. I can wing this. Keep reading. I could feel my ears heating up and my face breaking out in a sweat. I wasn't sure I could breathe. My clothes were stifling. In a millisecond I evaluated my audience. A bunch of women, almost all older than me, and a few men who looked very married. Safe people. You gotta do what you gotta do. "Listen," I said, "You'll have to excuse me, but I'm at that stage." And I pulled out my bookmark, an old postcard-sized reference card from Paul's mom listing a prisoner in Gospel Echoes' Bible course program, and I rapidly fanned myself until the crisis passed. "We understand," said the ladies, laughing. "We've been there." The men didn't act perturbed. It probably made them nostalgic, like they should reach around and grab a Windows for Dummies off the rack and help me out. When I came home, two people from the audience had posted pictures of the event on Facebook. One of the shots had caught me in the heat of the moment, little white card flapping. I showed it to Emily. She laughed. "Wow. Really??" She'll get it when she's 50. And that chic little jacket I wore? That one that is 45% wool and has a row of five closely-spaced buttons that are fastened shut with hard to manage loops? That jacket can quietly go into the attic until this stage is over. "Enjoyed hearing RG columnist Dorcus Smucker read tonight at Barnes & Noble. Especially the story about fishing with her son. And especially especially when she said the word "puke."" --Bob Welch, who until recently was also a RG columnist, on facebook. American young people need to grow up. Generally, the less I read about the normal American youth/young adult culture Out There, the happier I am, but last week, like a sheep to the slaughter I followed a promising link on a well-known website. "23 Things To Do Instead of Getting Engaged at 23" it said. By a writer named Vanessa Elizabeth. I have five children between 19 and 27, none of which is engaged, but you never know, so my interest was piqued. It really didn't have much to do with getting engaged or married, in my opinion, except as a snarky intro. In essence, it was about why you shouldn't commit yourself or act like an adult, and treated me to such gems as "Because you owe it to yourself. You are a human being that deserves to thrive inside AND outside of a relationship." "Millennials deserve the opportunity to develop ourselves, alone." "But then I look at my life, my relationships, and my future... and I realize that, I'm ***** awesome." It could have been entitled, "23 Things to do Instead of Growing Up." This was not written for 13-year-olds in the throes of adolescent drama and selfishness and angst. It was for people in their early TWENTIES. Who have been through FOUR YEARS OF COLLEGE. And are out there making life and career decisions. I am serious. These people are encouraged to disappoint their parents, date two people at once, be selfish, and other such responsible, mature, adult, giving-back-to-God-and-the-universe-and-everyone-who-invested-in-you behaviors. The implication is that if you choose, instead, to commit your life to another grownup and take on the adult responsibilities that go with it, you are at best to be pitied. And I am wondering: what ever happened to growing up? I would guess your parents and for sure your grandparents were acting like actual grownups when they reached the age of 23. Working, committing, investing, helping, contributing, deciding, and leading. In fact, many of them were probably doing all that by 17 or 18. Maybe they ate a jar of Nutella in one sitting. But if so, it was because they were hungry for Nutella and not to prove a point. And they were accomplishing a lot more than a Pinterest project in a given day. As I read that piece, I kept thinking of a young man named Richard. We met him when we went to Kenya in 2011 to look up Steven's old friends. 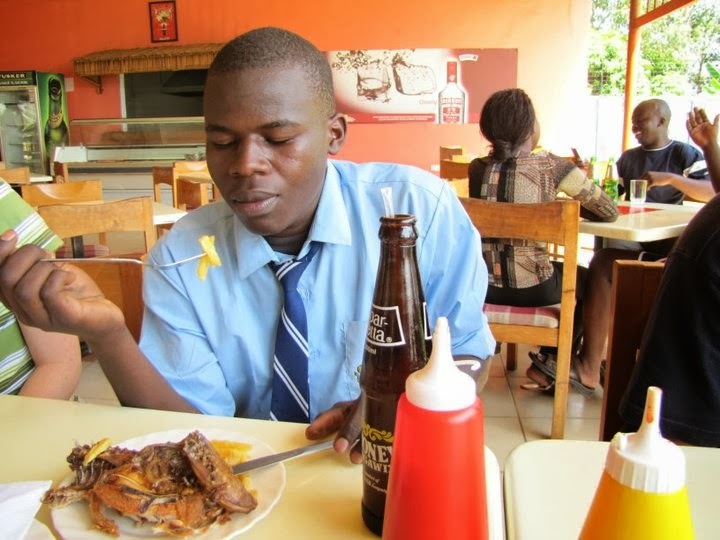 In an open-air restaurant we drank tea and ate chicken with half a dozen young men who were once orphan boys on the street, like Steven, and are still under the auspices of Into Africa but in a group home setting, rather than an orphanage. All of these guys know that their situation is shaky at best and a few wrong decisions on their part could derail all of their hopes and plans. They study hard, they work hard, they know there's no safety net once they're on their own. And they are deeply grateful to Into Africa for providing a roof over their heads and a chance at life. "Richard isn't here yet," we were told, and partway through the meal he showed up, a serious young man in a blue shirt and tie. Richard's parents had passed away some time before, putting him and his two little brothers in the care of two older siblings. Who then died, one after another. So Richard, at about 16, was responsible not only for himself but for two little brothers, one of who had a facial deformity that limited his options in life. In other words, Richard was an adult at 16. And this is Kenya. As I said, there is no safety net. Mercifully, Richard connected with Into Africa. They didn't offer him an easy ride anywhere, but they kept him and his brothers fed and cared for so Richard could go to school. Three of the orphan guys are brothers. The two younger ones look like they're about 12, and their older brother Richard joined us later, looking all sharp in a shirt and tie, after he had finished some exams at school. Their parents are dead, as are their two older sisters, and Richard takes his responsibility seriously as the head of the remaining household, hence the priority he gave to today's exams. I left the lunch early to go buy some supplies for the baby orphanage we'll visit tomorrow, and Paul told me that after I left, Richard's principal happened to come by. Paul asked her how Richard is doing. "Very well," she said, "didn't you see his tie?" He had a special badge on his tie denoting him as a student leader. He wants to go to college and be a mechanical engineer. At the time, he was hoping to do well enough to win scholarships into an engineering program. That must not have happened, because he is now in a teachers' college in a small town near Nairobi, and Into Africa is paying his fees. I am sure he is studying just as hard as he was three years ago when we saw him. Richard graduated from 8th grade PEFA school last year at the top of his class. He's such a fine kid. Is that equivalent to high school? And is he at university level now? And did he change his mind about engineering or wasn't he able to get into that school/program? 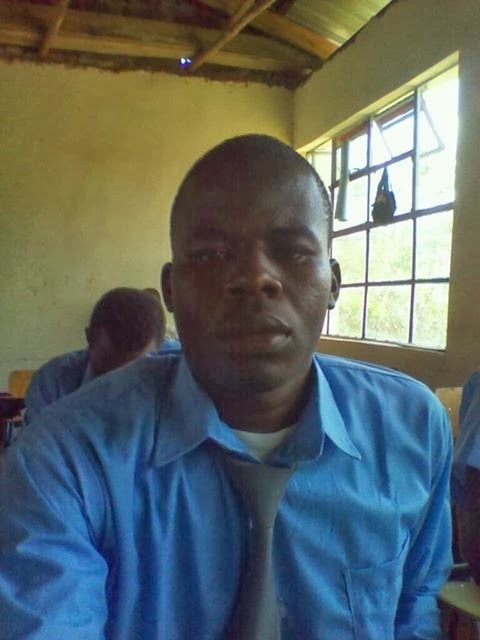 His first year out of high school, he worked for our fundi friend, Joel, to save up some money. This also gave him time to apply at a teachers college. Yes, apparently he changed his mind. He was able to buy his personal needs for college, which we wanted him to do if he could. You know, there, you have to have certain grades to be eligible to attend a college. The school he got into had a window of opportunity for him to get in, so we grabbed it. We felt like, if we could get Richard educated, and if money quit for IA . . . then Richard could take care of his brothers...and he would. Kevin and Vincent, his two brothers, are quite intelligent as well...and such nice boys! What a delight to have them at Into Africa! They're both in high school now, though Kevin, the younger, is one year ahead because Vincent got such a late start. Me: Did Vincent ever have surgery on his jaw? Yes, he did. It is still crooked, they said due to his age, but he can open his mouth normally now, chew, etc. He's happy! Richard and his little brothers, I'm quite sure, are not going to try to make strangers feel uncomfortable today. Or get a tattoo. Or make a big deal of baking a cake. Ok, I'm no doubt preaching to the choir here, and your young-adult children [or you!] got over themselves a long time ago and are out there blessing the world with their gifts and energies. But doesn't it make you wonder--why is it that blessings and affluence have produced Exhibit A, the writer of "23 Things," and poverty and hardship and sorrow produced the much-more-impressive Exhibit B? *Pay to the order of: Mission Dispatch / For: Into Africa Missions. Specify that it's for Richard Omollo Odhiambo and/or his brothers. I'll be at Barnes and Noble in Eugene for a book signing on Tuesday, January 28th, at 6:30 pm. The website features Ordinary Days but it's supposed to be for Tea and Trouble Brewing. I hope they're changing that. Feel free to show up, say hi, get books, or have me sign the ones you already have. On Babies Who "Shouldn't Be"
"I have this sense that I shouldn't have been. My parents were young and unmarried when they got pregnant with me, so they got married. They've never been very happy together, and it always feels like it's my fault. I can't get past this feeling that I wasn't meant to be." "My parents were older when I was born. I feel like I was a total accident. I know they thought their family was complete, and they didn't want more children. And then I showed up. I feel like I should never have been." We have been studying the women of the Bible in Sunday school. In the process, we've looked at the genealogy of Jesus. It couldn't have been chance, the number of questionable women and shouldn't-have-been people in the ancestral line of Jesus. God was making a deliberate point, I'm sure of it. Solomon, born of King David and Bathsheba, after the death of a child conceived with David while Bathsheba's husband Uriah was still alive and born after Uriah was killed in a terrible story of murder and intrigue. Perez, product of a semi-incestuous interlude with Judah and his daughter-in-law Tamar, conceived through trickery and more intrigue. Ruth, who came from Moab, which was not a place you were supposed to marry people from, and who married Boaz and was the great-grandmother of King David. And yet, these people and their often-bizarre stories worked their way into the family line of Jesus. Which goes to show that everyone's story can be redeemed. Perez even became so noteworthy that to be like him was considered a blessing. "May your family be like that of Perez," said the neighbor ladies when Ruth's baby was born. Today is Sanctity of Life Sunday. No matter the circumstances of your birth, God has great and redemptive things He wants to do with your life. You are supposed to be. There is redemption for your story. It was always Mom’s idea to go visit Charles and Mary Shelley on Sunday afternoons. We would climb into the buggy and head west on our curvy, one-lane dirt road in the hills of southeastern Ohio, to an ancient farmhouse with huge bushes around it. Charles and Mary were brother and sister of some impossibly old age, and my predominant memory of their place is the pervasive darkness. I recall the house as a deep weather-beaten gray on the outside, the paint long since peeled away. Inside, only a bit of dim light from the windows illuminated the accumulation of years. A narrow path led through the kitchen, past the table on the left with perhaps a dirty plate or the shriveled remains of a daffodil bouquet we had given weeks before, and the black wood stove on the right, with mysterious piles and objects beside and behind. Then we would turn left into the living room and sit around the coal-burning stove on uncertain chairs while Mary sat in a rocking chair that had an arm fastened on with baling twine. Everything was covered in coal dust. Anything we touched left a black smudge on our fingers. And everything we couldn’t touch was obviously dusty, as well — the lace curtains hanging in gloomy shreds at the dirty windows, Charles’ ragged jacket, the calendars from bygone years still hanging from nails on the ancient peeling wallpaper, the careful pile of empty Bufferin boxes on the once-lovely side table in the living room. Even Mary’s little wire-rimmed glasses were so smudged and dusty we didn’t see how she could see through them. With every visit, the details of that place embedded into my fascinated childhood mind. I remember longing to explore and discover the historic wonders in the shadowy corners. Legend had it that one door in the living room led to a parlor with an organ, and another door led upstairs to heaven-only-knew what treasures. But any curiosity on our part was quickly squelched by a glare from Mom, who sensed Mary’s nervousness when we wandered too far or poked too deep. My brother Fred managed to leave the conversation one afternoon and walk softly into the kitchen. He was inspecting the old wood stove when suddenly a rooster crowed loudly, right beside him, it seemed, and Fred was so startled he whacked his head on the overhanging pie-warmer. It turned out that Charles and Mary had felt sorry for their pet rooster, out in the cold weather, and had placed him in a wooden crate in the kitchen. So we would try to sit quietly and contain our curiosity while Charles and Mary told Mom and Dad about the old days and “Charlie’s” last visit to the doctor and if they were staying warm this winter and that they were thinking about maybe getting a telephone and how soon they predicted the bush outside, that their mother had planted, would bloom with its unusual, fragrant, coral-colored blossoms. We left Ohio and moved to Minnesota when I was 10. As I recall, other neighbors kept us informed, now and then, as the Shelleys grew older and eventually passed away. In the 40 years since, I have never met anyone quite like Charles and Mary. Which says a lot about my mother. Mom passed away suddenly last month at the age of 93. We traveled to Minnesota, where snow drifted deeply across the dirt roads, fierce winds blew, and the temperature dropped below zero the day of the funeral and burial. Mom would not have thought the weather was such a big deal, as she almost never let ice and snow stop her from anything. And she would not have appreciated that her funeral turned into such a big fuss, with people stranded at airports, cars stuck in snowdrifts and many worried phone calls, all for her sake. Among the family, publicly at her service and around the tables at the dinner that followed, our stories repeatedly circled back to what a remarkable person she was. Mom raked leaves and washed windows well past the age of 90. She quilted and sewed and crocheted, hauled and hoed and cooked and canned. She got enormous enjoyment out of watching animals out her windows and detailing their activities in letters to her large family. The deer and pheasants were browsing in the cornfield every morning, she would report. And the rooster thinks the feisty old cat with one ear is his girlfriend, she wrote me once. They hang out together every day, out by the barn. She trapped skunks in the old silo in a Havahart trap and killed rats in the garage. She made exquisite jellies and blessed her children with handmade rugs and quilts. But always, our stories and our amazement came back to Mom and her astonishing gift for noticing people. Unlike the rest of us, who often charge through life ignoring most people and taking note only of important ones who have something to offer us, Mom saw individual people with a sharp clarity, wise insight and heartfelt concern. Mom gave birthday cards to children and plates of cookies to the “old people” at church, who eventually were all younger than she and Dad. She hunted through the Amish newspaper, The Budget, for news of people who were sick or injured, and she sent them get-well cards or homemade scrapbooks with Bible verses and illustrations. She worried about teenagers who seemed to be struggling, and made a point of trying to encourage them. Mostly, though, we marveled at how Mom took note of the invisible people. In any crowd of people, Mom would locate the loneliest outcast and start a conversation. If you were dirty, poor or eccentric, Mom was your friend. If you were toothless and cussed a bit, so much the better. If you were the sort that everyone walked by without seeing, Mom would not only see you but shake your hand and ask how you were doing. If you served anonymously behind the scenes, she searched you out, thanked you, and made you a pan of cinnamon rolls for Christmas. And if you were isolated from the rest of society, like Charles and Mary Shelley, she found you, visited you on Sunday afternoons and made sure you stayed warm in winter. I don’t think it ever crossed her mind that people might not quite know what to make of this friendly Amish woman. Nor did she worry about appearances, or association, or what important people might think. In the fifth grade and new to public school, I made the mistake of telling Mom about a girl named Carmen in the fourth grade who always looked sad and dirty. Even though Mom had never met her, Carmen became her project. I was supposed to talk with her. I was supposed to be her friend. My protests that we were in different rooms made no difference. We passed on the stairs, didn’t we? All right. You can be nice to her then. I didn’t try telling Mom my biggest concern, that it would not be cool to be Carmen’s friend. I wasn’t that stupid. That spring, Mom’s craftsy sister gave her a large homemade candle shaped like an egg. Mom had a brilliant idea — I was to give this to Carmen, to show her that somebody cared about her! I kept silent about the fact that this was a terrible idea in every direction, and I meekly carried the heavy candle, wrapped in tissue paper, to school, where I mercifully found Carmen momentarily alone and gave her the candle. To Mom’s joy, she met Carmen in the laundromat downtown not long afterward, recognizing her from my descriptions. “Did Dorcas give you a candle?” she asked. You would have thought Mom had won the lottery, she was so pleased. Mom always turned to sewing during the hard transitions of her life, and these days, since her passing, I find myself doing the same. I sew dresses for my daughters and cut out a new bathrobe and run my hands over my stash of cotton scraps, planning projects like Mom’s that are useful and resourceful and economical. Mostly, though, I think not so much about sewing or even about missing Mom but about having eyes that really see. I wonder how one receives that rare vision that focuses not only on projects and deadlines and prominent people, but on the dirty, the invisible, the outcast, the dusty and lonely treasures down a hidden gravel road.